A few weeks ago we took a closer look at restorations of Victorian buildings, in which Judith Lynch had documented 1970s reversals of façade “modernizations.” Mostly taking place in the middle of the twentieth century, the stripping or covering of millwork details in favor of slathered on stucco, tacked-on asbestos shingles, or glued-on fake stone was about both upkeep and fashion. “Never paint again,” was the promise of these weather-resistant coverings, while contractors offered transformative conversions of old houses to match new popular period revival styles. Art Siegel, one of our great volunteers, noticed in the OpenSFHistory collection an example of this practice in action, and earlier than is usually assumed. Here is the west side of Church Street viewed from Liberty Street in April 1914. The Department of Public Works is documenting the street, perhaps with plans to pave the dirt road. Note the Italiante cottage second from the right, situated a little below the street grade. Here is the same view in December 1914. The street still hasn’t been paved, but our cottage has been transformed over the intervening eight months. It’s raised, with entry stairs now inset, the whole building encased in siding and stucco with a new parapet. The end result would be a mash-up costume of Spanish Colonial and Classical Revival for our old Italianate, one that has stuck and can be seen today: red clay tile, a couple of pinnacles on the new parapet, a window with a surrounding arch molding at the old entryway. The ram’s head likely is a more recent addition. 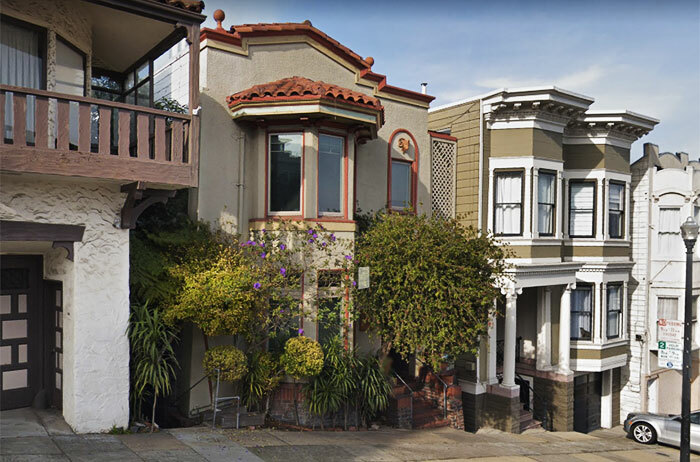 While many of us would pine for the original Victorian, all in all, it’s a fairly handsome and well-kept house with a grand view downtown over Dolores Park. West side of Church Street between Liberty and 20th Streets, 2018. 824 Church Street at center. Three of the four buildings in our original photograph are still standing in 2018. The houses on each end had garages installed, along with some smaller changes, and the old barn is gone, replaced in 1930 by a very exuberant residence of mottled stucco and Spanish-inspired balconies. And perhaps most importantly, the street did finally get paved.